However, at this installment, we would like to focus on the principal form of lodging that mostly overlanders prefer to use which is the camping in any form and possible way. Fact No1: Overlanders love outdoors. Off-the-grid wild camp or bush camp or dry camp, boon-docking or organised campground with full hookups, you name it. All travellers with mechanized -or not- transport such as camper vans, trucks with campers, mega trucks, motorbikes & bicycles wait for the moment they will pitch their tent or just open their awning, unfold their chairs and table, set up their little cozy camping area, cook their dinner, and enjoy their beer or wine under the stars (this is quite oversimplified but we have to make it sound as idyllic as possible, no?). Plus, there is no better travel “tribe” to protect the natural environment than overlanders. They love the nature and they have the absolute know-how on how to respect & save it (especially when locals in some less developed or developing countries do exactly the opposite). 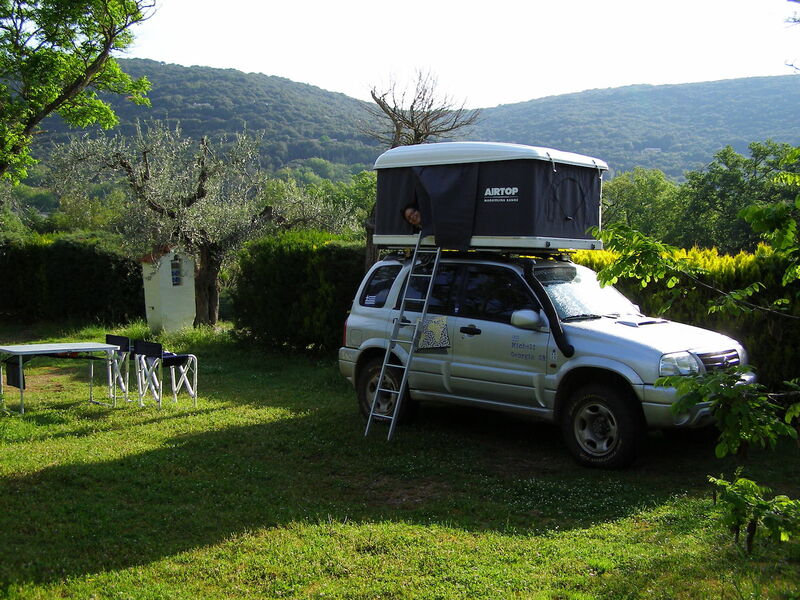 Fact No2: Overlanders have invested on camping equipment & travel gear. The hospitality industry has not been designed around overlanders but it does not work the same for travel & camping equipment which nowadays is so advanced & innovative and actually caters for all types of travellers including overlanders. Waterproof tents, portable stoves, roof top tents, waterproof backpacks, pop up roofs, portable solar panels, 4 seasons sleeping bags, air mattresses, you name it! The variety is endless and hopefully the travel gear industry has not been saturated yet -at least in ideas and offers. Plus, the vast majority of overlanders travel in self-contained vehicles or -at least- are autonomous and sustainable for a good amount of time. Fact No3: Design, invest and run a campsite is not a big deal. OK, it’s another business that has expenses, responsibilities, and of course risks to take. But, if compared to other accommodation facilities that travellers stay like a hostel, a hotel, a B&B, a resort, a lodge or a just a guesthouse, the campgrounds have -usually but not always- reduced start up and running expenses, demand less maintenance and it is pretty easy to upgrade or change them -if needed. On the other hand, just because it is a low-key investment, it’s not a business to make crazy money. Most campsites are small in size compared to big hotels and lodges and so can accommodate less people. Plus, it is usually required from the guests to carry their own camping setup which can vary from a tent to a whole caravan or motorhome! After 1.800 days traveliving around the world, two vehicles, more than 112.000 km in 46 countries and 3 continents, we have to say that the accommodation facilities we have experienced is like a box of chocolates; you never know what you are going to get. Some were exceptional and we would love to return anytime while for some others, we would prefer to forget as soon as possible. Some were overpriced, some others where extremely undervalued and finally some were a bargain. Some were filthy as hell but some others were neat, tidy, clean and shiny! Last but not least, some were proper campsites with grass, shady spots, electric hookups, water taps & potable water, clean & spacious toilets and showers, fast & steady wifi connection, laundry facilities and sinks, communal areas and, maybe, a funky bar & a restaurant with delicious food. On the other hand, some were the back yard or the parking lot of a hotel, a lodge or a hostel with all or some of the services that proper campsites offer to their guests. Finally, we have encountered hosts and business owners who were thrilled to accommodate people from all around the world, check their crazy vehicles, listen to their stories, and be proud of hosting Greeks, Americans, Australians, Dutch, Germans, you name it! On the other hand, we met hosts and owners who did not bother at all to make you feel like home and their only expectation was limited to pocket your money just because you are an overlander and obviously you have a lot! After all, we tend to think that 5 EUR (or 6 USD) per person per night is a fair deal for the overlander and the campsite owner for the reasons & experiences that mentioned above and this should be the universal standard all around the world!